With 24g of cold-processed, cross-flow micro and ultra-filtered, undenatured protein per scoop, Bodylogix® Natural Whey is designed to help you get the most out of your workout and support your performance goals. Formulated for unparalleled taste, it is also non-GMO, gluten free, made in a peanut free facility and contains only natural colours, flavours and sweeteners. 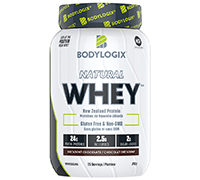 As one of the cleanest proteins on the market, Bodylogix® Natural Whey will help supplement your diet without compromising on quality or taste. Contents Tested & Certified by NSF, a world-leader in third party testing, ensures the highest quality and safety standards. Protein blend 31.05 g (whey protein concentrate, whey protein isolate, whey protein hydrolysate) (24 g of complete protein) (cow’s milk). Natural flavours, Dutch cocoa powder, Soy lecithin, Stevia leaf extract, Xanthan gum. Add 1 scoop (32 g) to a blender, shaker cup, or glass filled with 177-237 mL (6-8 oz) of cold water or your favourite beverage (vary the amount of liquid to achieve your desired taste and sweetness level). Blend, shake or stir for 20-30 seconds or until powder is dissolved. Take a few hours before or after taking other medications. Consume once daily.